Please fill in the short form below with your question, either about the Icom IC-M73 Euro, or for some technical advice. Please include details of your vessel if you feel they will help us answer your query. The IC-M73EURO’s 6 Watts of transmit power will provide extended communication range for the user. *Typical operation with 5:5:90 duty ratio. With the OPC-1392 headset adapter cable you can use a variety of optional HS-94, HS-95 or HS-97 headsets*. 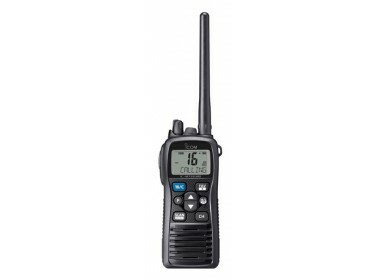 The IC-M73EURO has VOX (Voice Operated Transmit) capability for hands-free operation. Also, the VOX gain and VOX delay time are adjustable.